Filming is currently taking place for Zoolander, and Ben Stiller took some time out to let us known what has changed for the dim witted, really, really good looking male model in the almost fifteen years since the first movie hit the big screen. Most notably, Derek started a family, and the actor shared with Instagram our first look at the son of Zoolander, Cyrus Arnold (from t.v. shows Sam and Cat and About a Boy). Next to nothing is known about the sequel, bar Justin Theroux is taking over directing duties from Stiller, and joining Stiller in the returning cast is Christine Taylor, Owen Wilson, and an all but confirmed Will Ferrell. 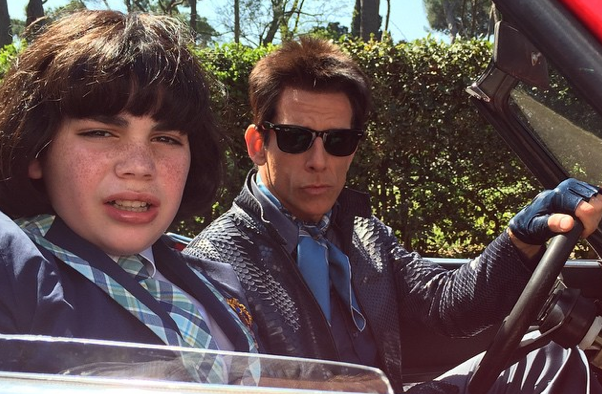 Zoolander 2 is set for release February 12th 2016.